Since 5 April 2004, AEOs issued under the Courts Act 2003 (“the 2003 Act”) by the magistrates’ courts in England and Wales have been deductible by fixed tables in a similar way to Council Tax attachments currently deducted by employers. The order comes into force on the day you receive it. You should begin to make deductions the next time you pay your employee and on each future pay day. There is no liability for a fine for non-compliance with the order if the first pay day falls within seven days of the date the order was received and no deduction is made on that first pay day. You should make deductions from your employee’s earnings until the total debt owed by your employee is reached. If you receive an order for ongoing maintenance, you should make deductions until the court tells you to stop. How much to deduct on a periodic basis? Upon receiving the Magistrates court order it will show the total amount to be deducted from the employees’ NET pay until the order is fully paid. 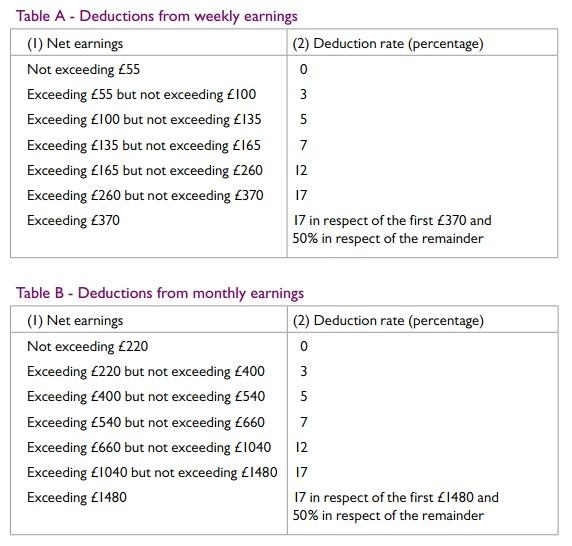 Use the below tables to calculate how much to deduct until the total amount is paid. 4) Click ‘Add Attachment Order’ and select the appropriate Attachment Order from the listing. 1) Enter a description for the Attachment Order. 2) Enter the reference number of the Attachment Order, which can be found on the documentation received. 3) Enter the date the Order was made. 4) Enter the date to apply the Order from. 5) Enter the date to stop – the Order should only be stopped once the full amount of the Order has been paid or you have received notification from the Courts to stop it. 1) Priority – tick the box provided if the Order is a priority order. 2) Admin Charge – tick the box provided if you, the employer, wish to deduct £1 as an administration charge for operating the Order. 3) Enter the total amount to be paid. 4) Cumulative amount paid at start - if the employee has already paid some of the attachment (for example in a previous employment) enter the amount here. BrightPay will now apply the Attachment Order on the employee’s payslip from the relevant period.